Revamped pro shops are beckoning golfers and non-golfers alike with eye-catching displays and merchandise specials. Popping into the pro shop for a quick club fitting isn’t the only reason any more to pay a visit to this part of the property. With more clubs and courses investing in this side of their business, and expanding their space and shelf stock to also give non-golfers a reason to stop in, the standard retail experience is being transformed into a more engaging atmosphere that invites members and guests to check out all the merchandise and shop smarter. At Woodhaven Country Club in Louisville, Ky., the previous golf shop incarnation was not living up to the club’s reputation. “Our club motto is that we are ‘the friendliest club in town,’ but the golf shop was not friendly or inviting,” explains General Manager Richard Schmitt. A red oak wood décor with poor lighting, dark carpeting and tinted windows made for a dated appearance. “The merchandise was simply getting lost in in the sea of darkness and consequently, golf shop annual sales were stagnant for the past five years,” Schmitt adds. That all changed this past April, when the club unveiled a redesigned shop with a much brighter and more modern interior. While the original 1,200-sq. ft. footprint remained intact, the renovation showcases a more welcoming atmosphere. Located at the rear of the clubhouse, adjacent to the men’s and women’s locker room and next to the member lounge, the shop gets traffic from approximately 1,200 members each week. Easy access to the shop is now offered via doors that lead from the golf cart staging area and the member lounge. A golf registration counter is situated in the middle of the two doors, helping to boost foot traffic and creating what Schmitt calls a “triangle effect” highlighted by bright white nesting tables featuring folded shirts and shorts. “These new displays have made our apparel contrast against the white fixtures, popping off the shelves,” Schmitt adds. All-LED lighting creates a cleaner, more polished display area. “Fall is football season, and we use the wall to feature our college merchandise and the very competitive local rivalry of the Louisville Cardinals versus the Kentucky Wildcats,” says Schmitt. Also of note is an indoor putting green, which helps to promote putter and wedge fittings and also provides some indoor entertainment for members during inclement weather. In just a few short months, the redesigned pro shop has already proved its value, Schmitt says, with golf shop sales seeing an uptick by 20 percent and more non-golfing members also stopping in. Tasteful use of display tables and other fixtures has helped the Country Club of Lincoln and its Director of Golf, Nick Muller, PGA, earn Merchandiser of the Year awards—and a tripling of sales in five years. “The new modern retail look, coupled with a new buying strategy of offering more non-golf club memorabilia and apparel, has attracted many more social members to the shop,” says Schmitt. At The Dunes Golf & Beach Club in Myrtle Beach, S.C., the golf shop was not receiving the attention it deserved. While certain components had been updated in dribs and drabs over the past 30 years, the shop lacked a cohesive style. The member concierge desk in the golf shop at The Dunes & Beach Golf Club is set aside as a place for staff to assist golfers with special orders, book tee times and post scores for handicaps. “The old shop had a low ceiling, poor lighting and fixtures ill-designed for today’s performance fabrics,” explains Head Gold Professional Dennis Nicholl, PGA. A long-overdue renovation began last November, and the new 2,100-sq. ft. shop opened its doors this past March, maintaining its location just off one of the main clubhouse entrances. With 32,000 rounds of golf played annually, members and guests of The Dunes warrant their own amenities in the golf shop. “The concept was to create a bifurcated space with a side of the shop called the ‘Member-Focused’ space and the other side considered the ‘Resort’ side,” Nicholl says. A large display fixture helps to separate the two sections. High-end seating, comprised of alligator-wrapped leather chairs, a large television and a charcoal leather couch, makes up the member area. A concierge’s leather inset desk offers a place for staff to assist golfers with special orders, book tee times and post scores for handicaps. While the original shop’s green carpeting and mahogany fixtures represented a more universal, albeit dated design, the updated ocean palette reflects a coastal look and feel. Greywash flooring pairs nicely with two-tone grey fixtures sporting brushed nickel hardware. Light green and grey walls and wallpaper with nickel metallic accents further enhance the décor, as do the charcoal doors and trimwork. LED cans and track lighting are positioned throughout the shop, with special-accent LED puck lighting for the fixtures. The members-only room of The Dunes Golf & Beach Club’s renovated pro shop includes a putting green, which has become a popular attraction at many properties to promote club sales and provide entertainment. To improve efficiency in daily shop operations, the former receiving room, which housed deliveries and stored back stock, is now strictly used to maintain shipments. After closing off two walls in this space, a new merchandising suite was created, complete with storage cabinets, hang bars, steaming area and folding tables. This revamped layout is better suited to handle new merchandise, including special items for members. Prior to the redesign, the shop was only able to sell select apparel in limited quantities. “Now that we have a dedicated space for members-only merchandise and a new attractive 1948 Members Only Gator logo, the sales of our members only merchandise has been off the charts compared to prior years,” notes Nicholl. As part of a multistage facility-wide renovation, the KemperSports-managed Forest Creek Golf Club of Round Rock, Texas, redesigned its golf shop last January. “The ambitious golf course and clubhouse improvement plan was implemented to highlight the natural beauty of [Texas] Hill Country and improve the conditioning by implementing industry-leading technology and construction practices,” says General Manager Jeff Dayton, PGA. Situated inside the clubhouse, the 2,700-sq-ft. shop receives tremendous foot traffic, generated from an estimated 40,000-plus golf rounds per year. Outfitted in a contemporary fashion, this space is awash in earth tones of beige and light brown walls and beige and brown carpeting. Local memorabilia, including a Texas Central Amateur trophy and assorted frames and prints, add a personal touch to the rest of the décor. 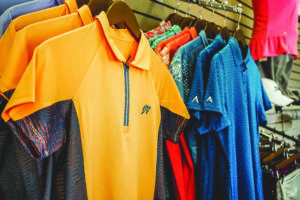 To keep its inventory fresh and inviting, the Forest Creek GC golf shop highlights new items—and in particular, shirts from popular brands—in the highest-traffic areas. Upon entering, members are met by displays featuring the latest apparel, displayed in mahogany fixtures with nickel arms. A combination of adjustable three-to-four ways, along with a long mahogany rack, multiple shelves and tables and two slot walls that can be rotated, house everything from hats and shirts to golf balls and water bottles. “We place our logo on everything that we can,” says Dayton of the personalized merchandise. To keep inventory fresh and inviting, the golf shop highlights new items—namely, shirts from popular brands—in the highest-traffic areas. Color-themed vignettes also correlate with the season or upcoming holiday. “Many times, the club will utilize red, white and blue in displays [to represent] city, state and country colors,” Dayton notes. 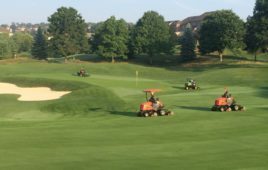 Although the shop has been closed as Forest Creek completes a golf course renovation, it is scheduled to re-open this month, and Dayton is confident that retail sales will increase once members are back on the greens and in the shop. At the Nashua (N.H.) Country Club, a new pro shop was unveiled this past April, marking the completion of a major construction project. “The membership has changed in the past twenty years, and they are demanding higher quality facilities,” says General Manager David Scaer of the outdated 1950s-era building that was replaced, situated on the site of a former farm. And with members racking up approximately 23,000 rounds of golf in a six-month season, the new shop is laid out to provide players with easy access to golfing necessities, and more. A stone’s throw from the clubhouse, the 2,930-sq.-ft. pro shop building is comprised of 1,080 feet of retail space. A front entrance moves patrons into a foyer with a historical display and sitting room, while the back door leads them to the L-shaped retail area outfitted with plaques that pay tribute to club champions. “The building is designed to replicate the feel of a farmhouse,” explains Scaer. Dark walnut cabinetry is balanced by a warm grey interior, accented by white trim, and the incorporation of reclaimed local wood further extends the farmhouse style. Large windows in a 24-foot-high cathedral ceiling allow sunlight to pour into the shop, while a picture window overlooks the 18th green, so players can keep on eye on the action outside. A combination of three- to four-way displays, along with a long mahogany rack, multiple shelves and tables and two slot walls that can be rotated. Multiple fixtures make up 40 linear feet of wall displays, including several tables and freestanding merchandisers, for a flexible arrangement of goods. “We follow a philosophy of creating an open yet full appearance at any level of inventory, while always providing walking paths and congregational areas,” says Scaer. The pro shop building is also stocked with numerous extras, including a bag room, club repair area, stock room, office, two bathrooms and a clubfitting studio. “The building features many amenities efficiently laid out, maximizing every square foot of real estate,” Scaer adds. House everything from hats and shirts to golf balls and water bottles in Forest Creek GC’s golf shop. “We place our logo on everything we can,” says General Manager Jeff Dayton. Since the debut of the pro shop, membership at the club has strengthened and Scaer is optimistic about the future. “The pro shop building has given Nashua Country Club the opportunity to better showcase our history and tradition,” he says.